The renowned San Franciscan columnist Herb Caen once wrote, “I tend to live in the past because most of my life is there.” Nowhere in world football is that sentiment more relevant than at Velež Mostar, the cellar dwellers of the Premier League of Bosnia and Herzegovina. With only a few weeks left in the current season, the once proud club sits dead last of the competition ladder with a mere eight points on board – 22 points away from safety – making relegation an inevitability. Their current plight is a far cry from its Golden Eras of the 1970s and ‘80s, when the Herzegovinian club challenged the ‘Big Four’ of Yugoslav football, featured in Europe, and were many people’s second favourite side in the former socialist republic. The city of Mostar is the capital of the south-western region of Herzegovina and is situated on the banks of the Neretva River. Its name is derived from the bridge keepers (Mostari) who guarded the Stari Most (Old Bridge) over the Neretva, and was built by the Ottomans in the 16th century. It is one of the most recognisable landmarks in the former Yugoslavia. To the west of the bridge is the city’s large Croatian Catholic community, while to its east is its Bosnian Muslim community, with the Bosnian Serb minority scattered across both sides of town. Overlooking the city is the Velež Mountain – named after Veles, an old Slavic God – from which the football club derives its name after its foundation in 1922. During the early years, a rivalry was established with the city’s other club Zrinjski Mostar, which was founded in 1905 by Mostar’s Croatian population. Velez was the successor of Ittihad, a club established in 1906 by Bosnian Muslims, in addition to several other clubs with working class origins. Over the decades a distinction has been drawn between the two regarding their political leanings. Zrinjski were the sporting hotbed of Croatian right-wing nationalism, while Velez’s distinctive red jerseys and Red Army supporter group led the club to centre itself on leftist politics and multi-ethnic ideals associated with communist Yugoslavia. Following the victory of Tito’s Partisan forces and liberation of Yugoslavia from fascist forces in World War Two, Zrinjski were banned, leaving the Rođeni (The Born) as Mostar’s primary football institution. They entered the Yugoslav First League for the first time in 1952, only to be immediately relegated to the Second League. They made a swift return two years later, and over the next decade or so established themselves within the league as a mid-table side. Their best finish was third in the 1965-66 season, but it was marred by the Planinić affair that almost saw Hajduk Split and Željezničar Sarajevo relegated from the top flight after a points deduction following their respective roles in a match-fixing scandal. By the end of the following season, Velež were an ageing team in decline and in desperate need of young blood. The club turned to Sulejman Rebac, a local 38-year-old former Velež player who had been one of the city’s first football superstars in the post-World War Two years, and one whose goals up front saw him earn a move to Dalmatian powerhouse Hajduk Split in the mid ‘50s. With relegation halted for one season as the Yugoslav First League expanded to 18 teams, Rebac put his faith in many of the club’s aspiring academy graduates, who had been born in the years following the war and raised in the Titoist socialist system that reigned supreme at the time. Three players came to define that era under the legendary Rebac: striker Dušan Bajević, goalkeeper Enver Marić and playmaker Franjo Vladić. Nicknamed the ‘Prince of the Neretva’, Bajević had made his senior debut in 1966, and by his 21st birthday in 1970 had won the golden boot alongside OFK Belgrade goalscoring sensation Slobodan Santrač. Velež surprised many pundits that year by finishing the season in third place and playing a free-flowing attacking brand of football, with the baby-faced forward spearheading the side. At the other end, Marić would go on to be one of the most distinguished goalkeepers to come out of former Yugoslavia, with the man who sported an unmistakable moustache winning many admirers throughout the nation. The youngest of the trio was midfielder Vladić, who Rebac handed his first-team debut at 18. His creative talents dazzled the crowds at the newly built 25,000-capacity Bijeli Brijeg Stadium, which become the club’s boisterous home for the next two decades. The three were given the nickname BMV (W not being part of the Serbo-Croatian alphabet) after the German automotive manufacturer, and symbolised the multi-ethnic nature of Mostar at the time given their respective ethnic backgrounds; Bajević (Serb), Marić (Muslim) and Vladić (Croat). But the trio were also surrounded by a host of other emerging players of prominence blooded by Rebac who would go onto have illustrious careers themselves. Young Jablanica-born forward Vahid Halilhodžić was promoted from the youth team in 1971 and, together with Bajević, formed one of the deadliest strike partnerships seen in Yugoslav football – the duo scored 269 league goals for the club. Centre-back Boro Primorac and left-back Džemal Hadžiabdić were esteemed defenders in the side who went on to earn international honours with the Plavi, while Jadranko Topić and Momčilo Vukoje occupied the right and left flanks respectively and added vital attacking support to Vladić, Halilhodžić and Bajević. Eighth and sixth place finishes followed their successful 1969-70 campaign, with Željezničar becoming the second Bosnian team to win the title in 1972 following on from their city rivals Sarajevo, who triumphed five years earlier. The emergence of teenagers Halilhodžić, Hadžiabdić and Primorac added further strength to an exciting young side. The 1972-73 season proved to be their most successful yet as they finished second behind a star-studded Red Star Belgrade side featuring the legendary Dragan Džajić, Jovan Aćimović and a fresh-faced Vladimir Petrović. Spurred on by that achievement, Velež continued their pursuit of glory in the following season, going toe-to-toe with Tomislav Ivić’s wonderful Hajduk Split side for the league title in 1974. Ultimately it wasn’t to be for the Reds of Mostar, who lost the title on goal difference, despite recording more victories than the Pride of Dalmatia. It was a season which would have seen them claim the title away from Split had the current system of three points for a win been in use, instead of the standard two used at the time. Small consolation for Rebac and BMV followed at season’s end as the four were rewarded for an outstanding six years of work in Mostar by being selected in Yugoslavia’s World Cup squad for the 1974 edition of the tournament in West Germany. Rebac was one of five co-managers of the national team, alongside Red Star’s Miljan Miljanić and Ivić of Hajduk. Fifteen of the 22-man squad comprised of players from the two previous title winners. Bajević became the focal point of the Yugoslavia attack and scored a hat-trick in their record 9-0 demolition of Zaire, as the Balkan outfit finished ahead of Brazil in Group B before suffering three successive defeats at the hands of eventual winners West Germany, a Grzegorz Lato-led Poland, and Sweden in the second stage of group games. However, with a host of other attacking options on offer, and Rebac undermined by the influence of Miljanić and Ivić, only Marić played every game – Vladić saw no minutes in West Germany. The goalkeeper’s good form at the tournament would see him make a move to Bundesliga giants Schalke in 1976 before returning to Mostar two years later, while Bajević and Vladić made big money moves to Greece in 1977 and 1979 by joining AEK Athens. Rebac himself left in the summer of 1976 following a mid-table finish, having successfully steered Velež to the quarter-finals of the UEFA Cup in 1975 by defeating Spartak Moscow, Rapid Vienna and Derby County in the process – the latter 7-2 on aggregate- before departing the competition at the hands of Twente in the final eight. Despite the departures of Rebac and many of Velež’s core players, the Rođeni earned respectable mid-table finishes heading into the 1980s. At the time much of the country was mourning the death of Marshal Tito in May 1980. Miloš Milutinović was appointed manager shortly afterwards and achieved immediate success in his first season in charge at Bijeli Brijeg. 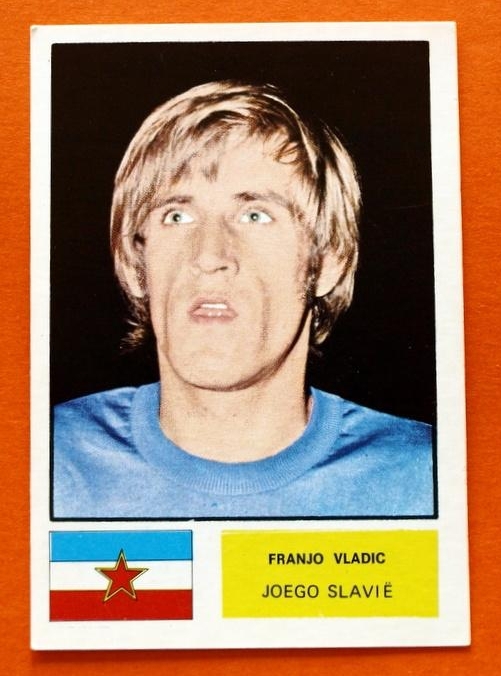 The former Bayern Munich forward – known throughout much of Yugoslavia by his nickname “Plava čigra” (Blond Buzzer) – led Velež to the Yugoslav Cup, where they faced rivals Željezničar in what was the first all-Bosnian final since the formation of the tournament in 1946. No team from the central Yugoslav Republic had ever won the domestic cup, at the time known as Kup Maršala Tita in homage of the former leader. Thousands of Bosnians flooded the Belgrade streets and stands of the Marakana Stadium of Red Star Belgrade on a warm late spring day on May 24, with a healthy contingent of Mostari making the trek in hope of seeing their beloved Rođeni win their first piece of major silverware. Mehmed Baždarević gave Ivica Osim’s side a dream start, scoring a penalty to give the blues from Sarajevo a half-time lead. The departing Halilhodžić , who had agreed terms with Ligue 1 outfit Nantes prior to the Cup final, restored parity 10 minutes after the restart with a tap-in from close range, before giving Milutinović’s side the lead minutes later with a trademark finish. However, another clumsy challenge soon after saw referee Vlajić point to the spot once more, leaving Baždarević to send Marić the wrong way and level proceedings. Velež were awarded a corner kick 10 minutes from time, which saw Blaž Slišković’s cross to the back post meet the head of Halilhodžić, who leaped highest and headed the ball towards goal. Teammate Dragan Okuka reacted quickest, heading home on the goal line to spark delirium among the 30,000 or so Velež fans who journeyed to Belgrade and outsung their counterparts from Sarajevo. 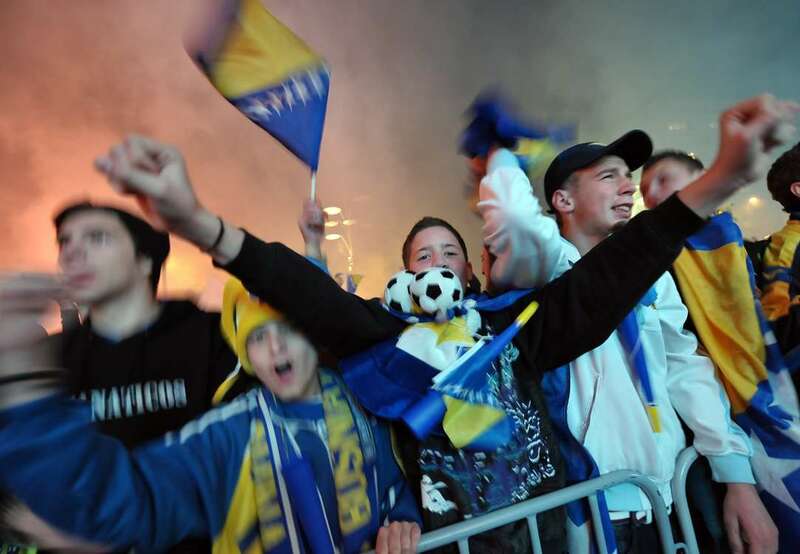 The players, staff and supporters celebrated long into the night, with the club’s famous theme song ‘Rođeni, Rođeni’ echoing across the nation capital and on return to Herzegovina. While Marić was in goal on that memorable day in the Marakana, and with Bajević and Vladić returning to the club following their time in Athens, a new generation of stars had emerged. Avdo Kalajdžić made his debut for the first team in 1977, and as an 18-year-old did well in replacing the influence of Boro Primorac in defence. Vladimir Matijević and Veselin Đurasović made their debuts in Rebac’s last few seasons at the club, and by the beginning of the ‘80s were established first-team regulars in defence. Okuka was another blooded by Rebac in the mid ‘70s who commanded the midfield and proved to be a focal point between defence and attack for Milutinović. Local winger Vladimir Skočajić was a starter that day, memorably scoring four goals in a league fixture against Dinamo Zagreb as the Reds triumphed 9-2 in February 1980. But for many Velež fans, the jewel in the crown of the new generation of players was the technically-gifted midfielder Blaž Slišković, whose father Vlado had played for the club two decades earlier. However, “Baka” as he was affectionately known, joined Halilhodžić out the exit door when he made the move to Hajduk that summer. Without these two players Velež struggled to mount a championship challenge as many in the newly formed supporter group Crveni Šejtani (Red Devils) had hoped – the Red Devils later became the Red Army, which is present today on the terraces of Vrapčići Stadium. Milutinović departed the following summer and was replaced by club legend Muhamed Mujić, who was Rebac’s strike partner extraordinaire in the 1950s and had taken over the managerial reins from him initially in 1976. Mid-table finishes followed, before the recently retired Bajević took charge of the club in 1984, just shy of his 36th birthday. In his second full season in charge of the club, and spurred on by an impeccable home record, Velež ended a highly controversial league season in third place behind the two Belgrade clubs. It was a campaign fought right down to the wire for a league title that is still heavily disputed to this day. Bajević’s men defeated champions Partizan in the quarter-finals of the Yugoslav Cup and went onto contest the final in the black and whites’ JNA Stadium home ground, where they faced Ćiro Blažević’s Dinamo Zagreb. The Croatian side had survived scares in the early rounds of the competition with nervy victories over Iskra Bugojno, BSK Slavonski Brod and Radnički Niš (the latter two on penalties), before emphatically dismantling rivals Red Star 4-0 in the semi-finals, leading many to back them as favourites heading into the final. The Velež starting eleven that walked out onto JNA Stadium that day featured seven players under the age of 25, with only captain Matijević and Skočajić remaining from the class of 1981. Midfielder Nenad Bijedić opened the scoring from the penalty spot in the sixth minute, with the Mostari controlling much of the proceedings for the remainder of the half. A not too dissimilar start to the second half saw Matijević set up Bijedić, who split the Dinamo defence and converted past Ranko Stojić to make it 2-0 in the sixth minute of the second half. Influential goalscoring midfielder Marko Mlinarić reduced the deficit minutes later with a superbly taken free-kick, before the game turned sour as Dinamo’s hard man defender Zvjezdan Cvetković was given his marching orders for an off-the-ball elbow on Bijedić. Velež sealed the victory late on as striker Predrag Jurić made it 3-1 in the 87th minute with a neat finish, although Bajević’s side finished the game with ten men following the dismissal of Matijević in stoppage time. Notable players from that squad also included home-grown defender Goran Jurić, who later won league titles with both Red Star and Dinamo, and represented the newly independent Croatia in the 1998 World Cup under Blažević. Mili Hadžiabdić, the young brother of Džemal, made his debut for the club at the beginning of the decade and entrenched himself as a regular in the Velež defence over the course of the 1980s alongside Ismet Šišić. Left-sided winger-come-forward Semir Tuce was named Yugoslav Footballer of the Year that season and made his national team debut under the newly appointed manager Osim later that year. Vladimir Gudelj, a substitute in the 1986 decider, would lead the frontline for the next five years alongside another youngster in Meho Kodro, with the duo bringing back memories of Bajević and Halilhodžić in their prime. As for The Prince, he remained in charge the following season as Velež suffered another near miss by finishing second by a point to Partizan in the league – despite accumulating three more victories than their Belgrade adversaries. His final season in charge of his beloved club saw them finish third behind the two capital city giants, with a Dragan Stojković-inspired Red Star toppling their near neighbours for first place. The Bajević years did see the club make a return to the European arena, representing Yugoslavia in the 1987-88 edition of the UEFA Cup. A comprehensive 5-0 demolition job at home to Swiss side Sion set them on course for a second round tie with German giants Borussia Dortmund. A disappointing 2-0 defeat in the Westfalenstadion saw the Rođeni written off ahead of return leg at the Bijeli Brijeg, which was packed to capacity as a crowd of just over 30,000 filled the arena. A foul on Gudelj presented Tuce with the opportunity to open the scoring from the penalty spot, only to be denied by a magnificent save from Dortmund goalkeeper Wolfgang de Beer. Gudelj had two good chances either side of the half to score, but the post and de Beer’s superb reflexes kept the scoreline goalless. The deadlock was eventually broken by substitute Kodro, before Gudelj once more saw the woodwork deny him. But against the run of play, Dortmund striker Frank Mill pounced and silenced the vocal hosts, making Predrag Jurić’s late winner meaningless in the grand scheme of things. Bajević departed the club at the end of the season after agreeing terms with AEK, for whom he played for between his two spells at Velež. There he won a Greek title as well as the Golden Boot in 1980, forming another deadly strike partnership with legendary Greek forward Thomas Mavros. Former Velež player Žarko Barbarić succeeded him and led the side to the UEFA Cup third round, defeating APOEL of Cyprus and Belenense of Portugal before falling to Hearts as a 3-0 defeat in the Scottish capital ended all hopes of further progression in what is their last European tie. A mid-table league finish was followed by another cup final appearance, although the 1989 edition of the finale was nothing short of a disaster for the Reds, who were comprehensively dismantled 6-1 at the hands of Partizan in Belgrade. After flirtations with relegation the following season, Franjo Džidić was appointed manager in 1990 and oversaw the club’s final two seasons in the league as the country around them began to disintegrate. Despite the simmering tensions of the time, two young players emerged from within the youth ranks and would become household European names a decade later with their respective clubs in Germany. Second striker and Mostar native Sergej Barbarez progressed through the club youth system before signing his first senior professional contract in 1990. He returned to the city from mandatory military service a year later and was a standout for the Mostari in the final season of the Yugoslav top tier. At the same time, a dazzling talent from Halilhodžić’s nearby lakeside town of Jablanica by the name of Hasan Salihamidžić arrived in Mostar in his mid-teens and was part of the club’s academy. 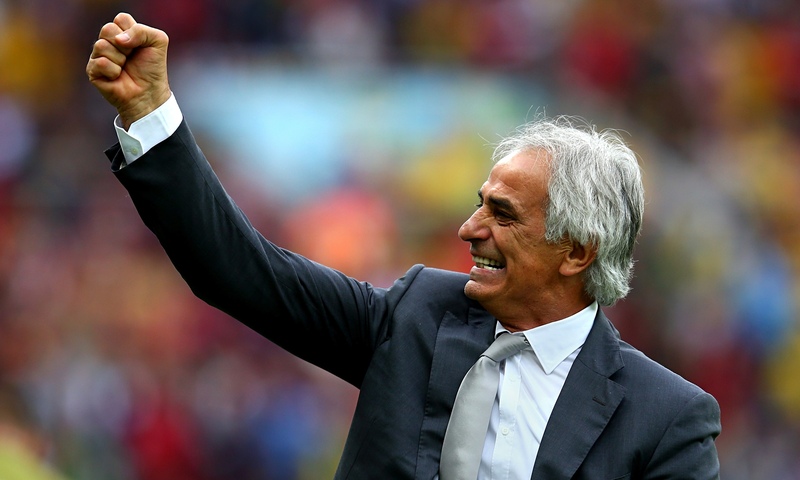 The Prince of Neretva left his home city in 1988 and has since become the most decorated manager in Greek football by winning four titles each with AEK and bitter rivals Olympiacos. Marić became goalkeeper coach at Velež under his former teammate following his retirement, before holding the same role with Fortuna Dusseldorf in the 1990s and Hertha Berlin over the course of the 2000s. Halilhodžić is the current manager of the Japanese national team, having taken the reins of the Samurai Blue last year after earlier guiding Algeria to the round of 16 to the 2014 World Cup in Brazil. His club coaching career saw him win the African Champions League with Raja Casablanca of Morocco, guide Lille to the French top flight and Champions League, before managing Paris Saint-Germain in the mid-noughties. He also won the Croatian league title with Dinamo Zagreb in 2011 before falling out with notorious club president Zdravko Mamić. Additionally, his playing career in France saw him win a league title with Nantes as well as two Golden Boots in Ligue 1. Aleksandar Ristić, a defender from the early days of Rebac’s time at Velež, was Ernst Happel’s assistant at Hamburg when the German side won the 1983 European Cup, before managing Schalke and Fortuna Dusseldorf in the 1990s. Many of the club’s young stars of the mid-to-late ‘80s went on to have distinguished careers following their time in Mostar. The hero of the 1986 Yugoslav Cup triumph, Nenad Bijedić, moved to Turkey’s Bursaspor a year later, where his performances earned him the nickname of Emperor. Coaching spells in the Turkish top flight followed post-retirement, before he sadly passed away at the age of 52 from leukaemia in 2011. Tuce moved to Switzerland in 1989 by joining league winners Luzern, claiming a Swiss Cup triumph before retiring in 1995 and residing in the country. Gudelj moved to Spain in 1991 and spent eight years at Celta Vigo in La Liga, where he stands second on the club’s all-time goalscorer list with 105 strikes to his name, and currently works with the club in an administrative capacity. Joining him in Spain was Kodro, who spent four years at Real Sociedad before Johan Cruyff brought him to Barcelona in 1995. He has held various coaching positions at the Basque club, as well as a short spell in charge of the Bosnian national team in 2008. Barbarez moved to Hannover following the onset of hostilities and established himself as a Bundesliga regular with Hansa Rostock, Borussia Dortmund and Bayer Leverkusen, while winning the league Golden Boot at Hamburg in 2001. 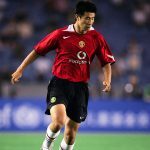 The Red Shorts also became the home of winger Salihamidžić, who moved to Germany at the same time as Barbarez, signing for Bayern Munich in 1998 winning numerous Bundesliga titles as well as experiencing Champions League success in 2001. He also spent four seasons at Juventus between 2007 and 2011. The paths of these footballers and numerous others that came through the academy set-up at Velež epitomises the large imprint left by the fallen giants of Bosnian football. No sooner had the first shots been fired in Sarajevo in March 1992, in Mostar the newly formed Army of the Republic of Bosnia and Herzegovina combined (ARBIH) with the Croatian Defence Council (HVO) to halt the Serb controlled Yugoslav National Army (JNA) from seizing control of the city. However, the goodwill between the two main ethnic communities of city would not last. The Croats from Herzegovina, under direct orders from Croatian president Franjo Tudjman in Zagreb, formed the Croatian Republic of Herzeg-Bosnia led by Mate Boban. Fierce fighting between the ARBIH and HVO followed in what became known as the Croat-Bosniak War, with the latter launching a 10-month siege on the eastern part of the city, forcibly expelling much of the Muslim population in the city’s west before infamously destroying the Stari Most. The Bijeli Brijeg Stadium and Velež were no exception, with the HVO seizing control and ownership of the stadium, evicting club officials who were forced to retrieve to the east. Halilhodžić himself was wounded but ultimately recovered before fleeing the city along with a third of Mostar’s population. Zrinjski returned from exile and immediately called Bijeli Brijeg home, while also making Velež midfielder Slaven Musa one of their first signings. 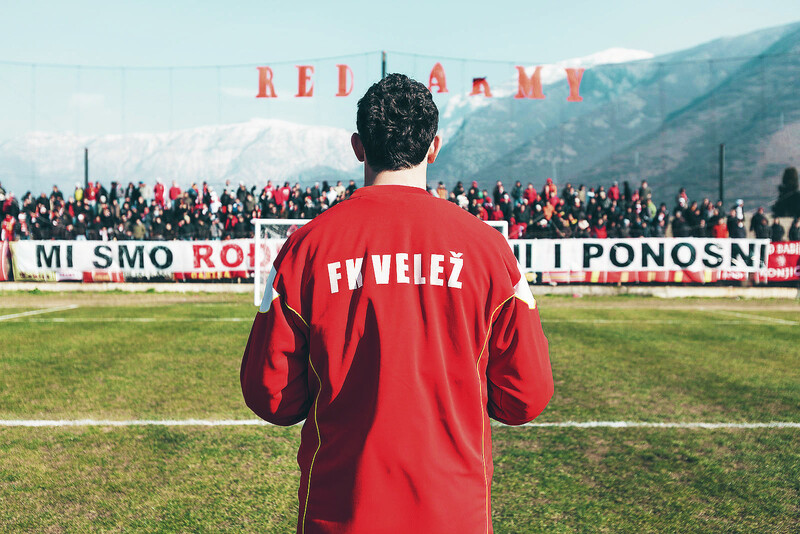 Banished from their spiritual base, the Reds moved to Vrapčići Stadium in the city’s northern outskirts, transforming a paddock into a modest 7,000 capacity stadium, but one nonetheless inferior to their former home. The two sides would have to wait until the new millennium to play against one another, with the Bosniak and Croatian clubs of Bosnia Herzegovina united to form a new national league in 2000 before being joined by their Serbian counterparts in 2002. Velež’s fourth place finish in the inaugural season stands as their highest, with the two-time Yugoslav Cup winners relegated from the top flight in 2003 and only returning in 2006. By then, Zrinjski and fellow Herzegovina-based Croat club Široki Brijeg had won three titles between them, with the former claiming their first league crown in 2005 – a year where they celebrated their 100th anniversary – under the tutelage of former Velež manager Džidić. Since then Zrinjski have won a further two league titles, while their rivals occupy multiple mid-table finishes, with the distinct on-field disparities replicated in the stands. The contrasting political ideologies of the two fan groups are noticeable to say the least. Zrinjski’s ultras embody a separatist mentality present throughout the club’s history, and can regularly be seen displaying banners related to Croatian nationalism and right-wing ideals. The Red Army, on the other hand, have maintained a strong left-wing, anti-fascist connection to their roots, with images of Tito and other leftist connotations commonplace at Vrapčići, despite the majority of its supporters being Muslims. May marks the 30th anniversary of the cup triumph Bajević’s side against Dinamo, 35 years since Milutinović’s starlets defeated Željezničar, a world away from the current plight of the league battlers who face a future in the second tier of Bosnian football, one so very remote from their glory days of yesteryear. While many of the troubles which face Velež today are self-inflicted due to internal factors such as poor administration, lack of finances and resources, in addition to a talent drain away from the city, there is no doubt that the forced relocation away from Bijeli Brijeg Stadium has played a substantial role for its spiralling decline, as has the troubling ethnic division that has lingered over the once multi-harmonious Mostar today. For many in the stands of Vrapčići and Velež supporters the world over, they can only look back at happier times when their team was one respected throughout Yugoslavia and across Europe. Like many institutions in the former socialist bastion, their story can be divided into two periods; before the war and after the war.